Code reuse, code querying and computer aided programming are some of the main research challenges in software engineering. Therefore, we have introduced CodeOntology as an approach to leverage recent advances in the Semantic Web area and the impressive amount of open source code freely available online, to provide a semantic view of software systems by extracting structured information from source code and by performing named entity disambiguation on the comments provided within the code, in order to link the corresponding entities to pertinent DBpedia resources. 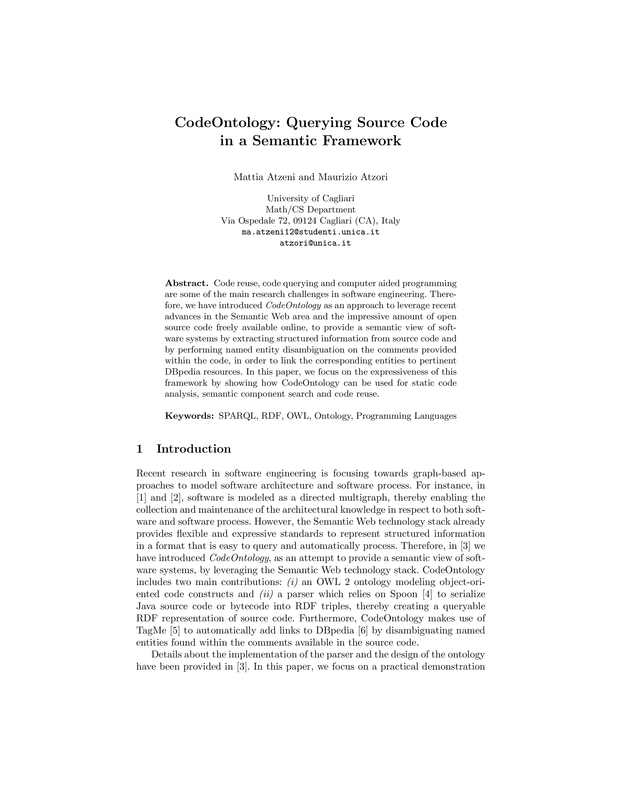 In this paper, we focus on the expressiveness of this framework by showing how CodeOntology can be used for static code analysis, semantic component search and code reuse.